There are 0 batchs in your cart. There is 1 batch in your cart. The Site delivers almost everywhere in the world. However the cost of transportation is not included in the price. 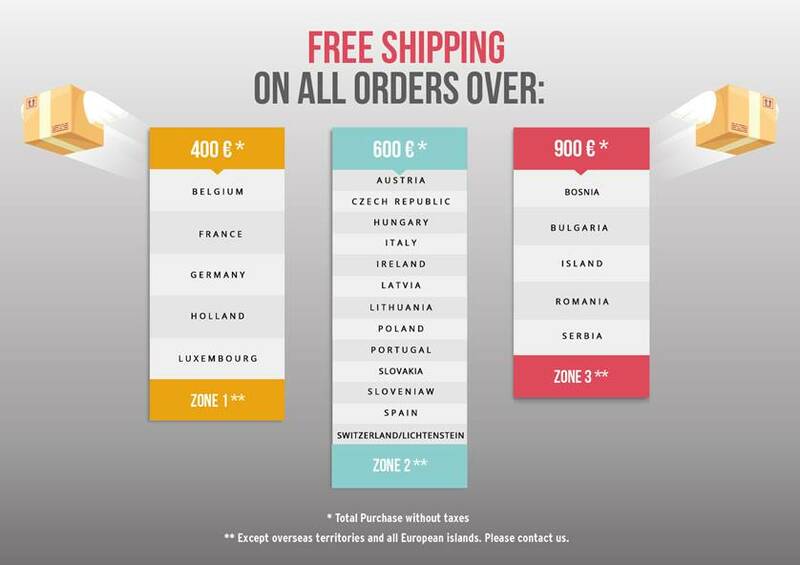 Currently, shipping costs are automatically calculated by the Website based on the shipping destination for all European countries; except Greece, Finland, Denmark, Estonia, Croatia, Norway and Sweden. Deliveries are operated by DACHSER or DPD who deliver within 48 to 96* hours with a tracking number. * Delivery times may vary between 2 to 3 working days and up to 10 days for some E.U. countries. The Site is committed to deliver orders within three working days following validation. Delivery costs, defined by the Site and upon request for the rest of the world, are at the charge of the buyer. Please send an email to info@merveyl.com specifying the item code, the number of boxes, the legal status of the purchaser (a company or a legal person) and the shipping address. You can also call us at +32 (0)2 478.95.17 for a no-cost, no-obligation quotation. Upon reception of your payment, your order will be shipped within 2 or 3 working days to the address provided. The customer shall ensure that the information provided is accurate. Reshipping costs as a result of a customer error will be fully billed to the buyer. The Site will not be held responsible for late deliveries due to mistakes or for disturbance resulting from the freight company. If one of the items purchased does not suit the Customer, the latter has the right to cancel his order within fifteen (15) calendar days of the day following the delivery, without any penalty or explanation, in accordance with the European and National legal provisions which are applicable to the Delivery Conditions. Within that delay, the Customer must notify the Seller of his intention to use his Cancellation right. For exercising the right of withdrawal, you must send a written request by registered or certified mail to the following address: Merveyl® _ Dooren 97, Industrial zone D. B-1785 Merchtem. The Customer shall receive a confirmation by e-mail. From the moment the Customer expresses his intention to return part or all of his Order, he has ten (10) calendar days to return the Products to the Seller. The non-compliance with that delay shall cause the Customer to be deprived of this Cancellation right. In consequence, he shall have to pay his Order. Items must be returned to the address of the Seller mentioned below, unless otherwise specified to the Customer, by any means of transport left to the choice of the Client, who must keep the dispatch proof : Merveyl® _ Dooren 97, Industrial zone D. B-1785 Merchtem. The costs and risks of the return dispatch are supported by the Customer. If the Customer paid his Order by credit card, once the returned articles shall have been checked, an amount shall be credited on the credit card used by the Customer, corresponding to the returned articles Purchase Price, reduced by the amount of the purchase voucher(s) or discounts used to pay the Order. The reimbursement to the Customer shall be made according to the methods agreed upon with the card issuing bank. If the Customer paid by another mean of payment, the reimbursement shall be paid by bank overdraft, to the bank account provided by the Member on the certified mail. The Customer shall not be entitled to this Cancellation right if the delivered Products have obviously been used for more than a few minutes, are damaged or if there are missing parts. The Products must imperatively be returned properly protected, in their original packaging, in a perfect state allowing their resale (not damaged nor dirty). Otherwise, Products cannot be returned. The articles sent but not accepted for return shall be kept by the Seller at the Customer's disposal. The Customer must take them back and pay them. In case of abnormal or excessive returns, the Seller reserves the right to refuse any further Order. To meet your needs, pre-requisite and budget, our teams will design the optimum item for you. Thereby, Merveyl is the expert in bespoke items for Hotels and Luxury spas. Our high level of service and flexibility are particularly appreciated.